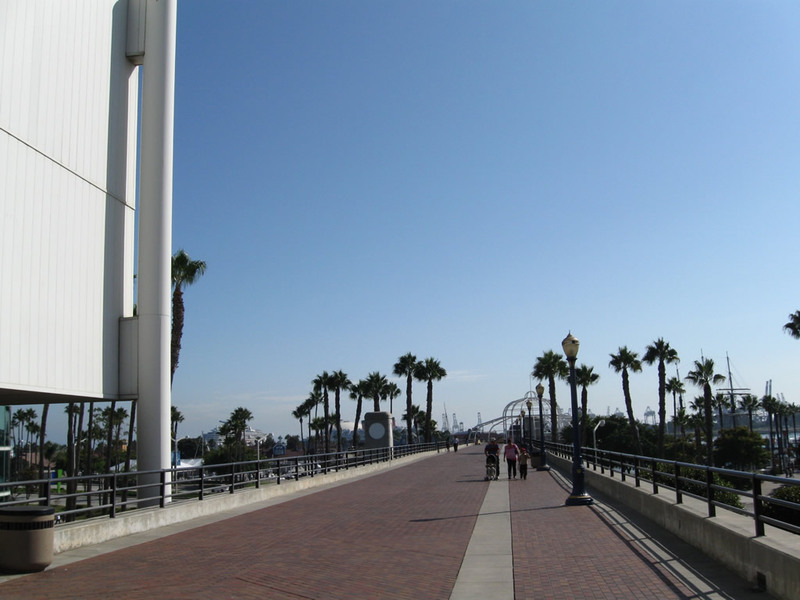 This view looks west along Shoreline Drive from a pedestrian bridge connecting the Long Beach Convention & Entertainment Center to the Rainbow Harbor Esplanade.. 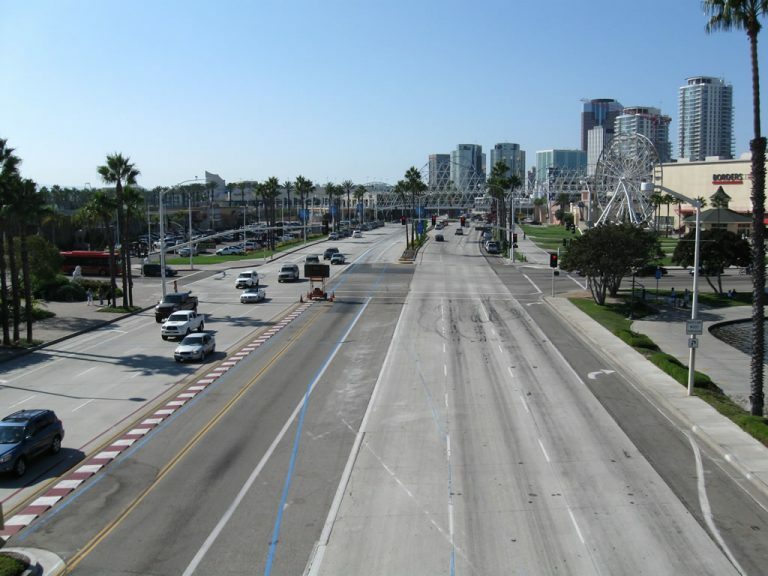 The multi-lane highway (part of the Long Beach Grand Prix Circuit) sweeps from Ocean Boulevard southwest toward Long Beach Harbor. 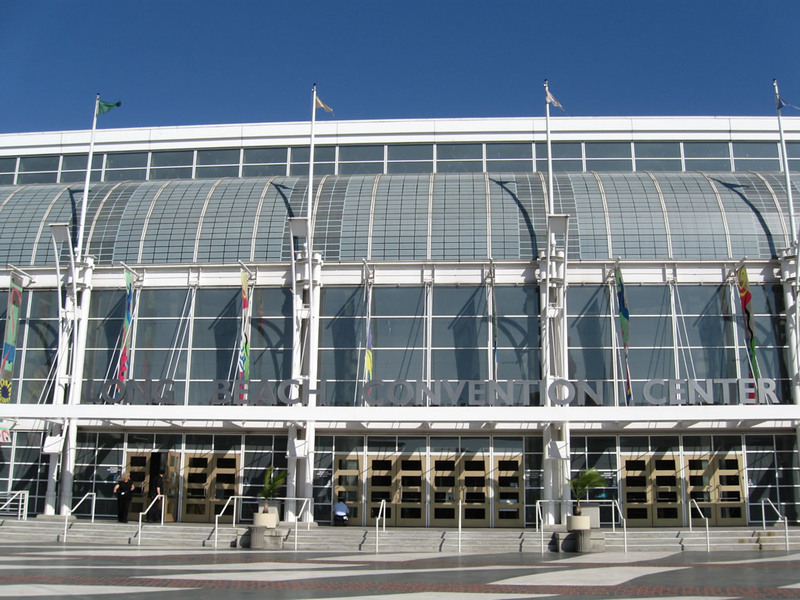 To the north of Shoreline Drive is the convention center, Long Beach Arena and the Pike at Rainbow Harbor. 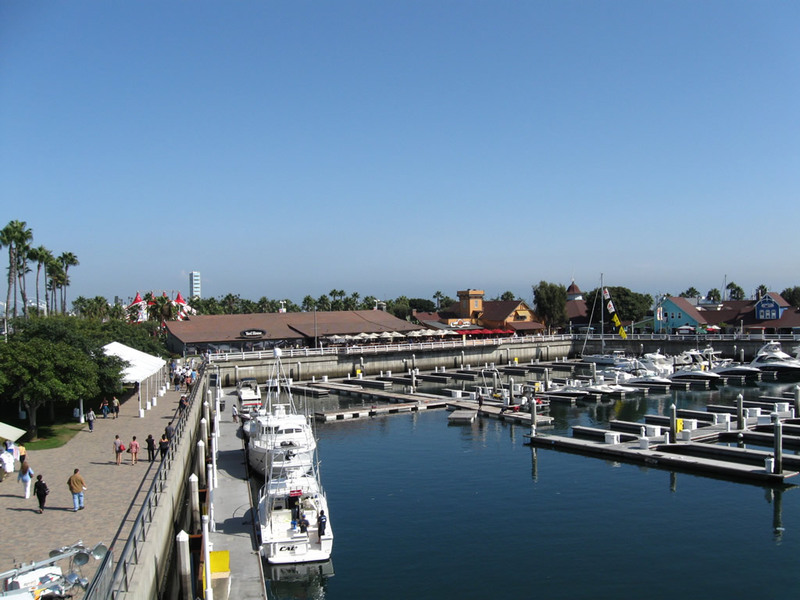 To the south is the Downtown Long Beach Marina, Shoreline Village and Rainbow Harbor. In the distance is the intersection with Pine Avenue and Downtown. Photo taken 09/28/08. 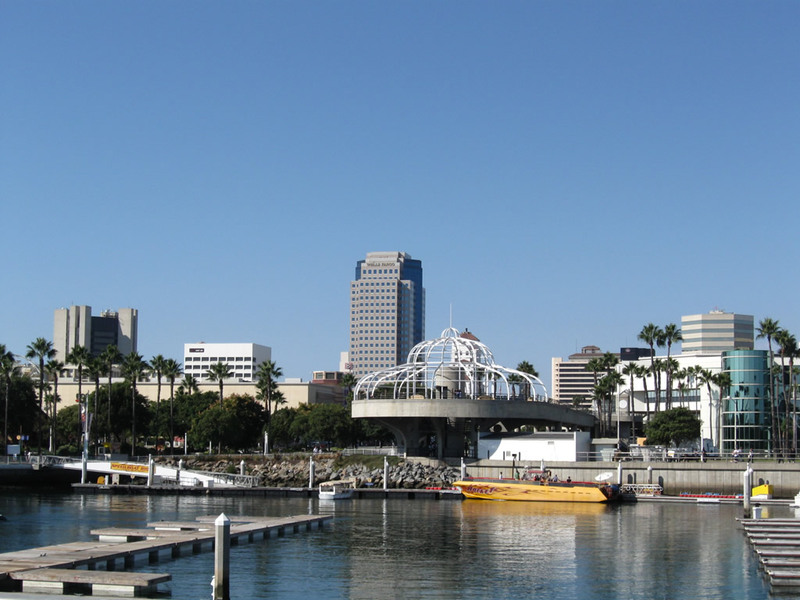 The city of Long Beach is the second largest city in Los Angeles County and is one of the most populated cities in California. Long Beach was incorporated on February 10, 1888 and then disincorporated July 24, 1896. It incorporated again on December 13, 1897. 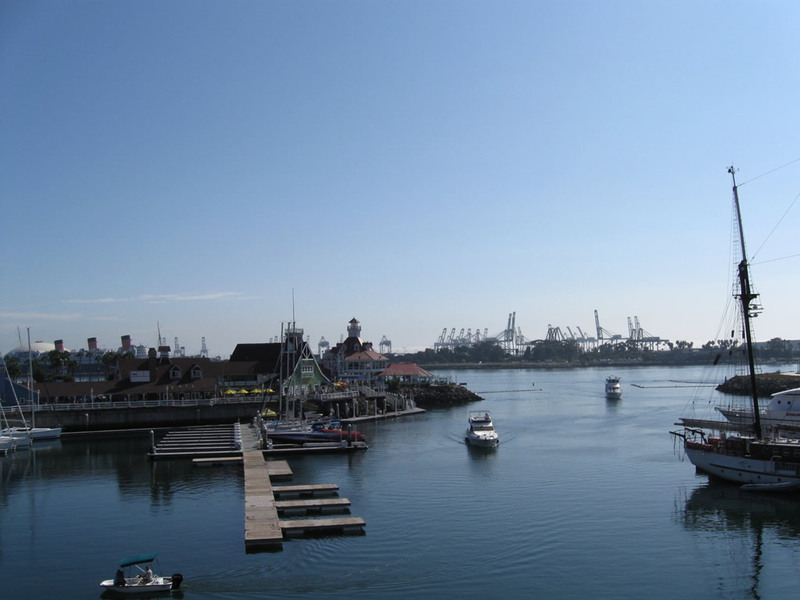 The city of Long Beach (“Many Unique Neighborhoods, One Great City”) is home to the busy Port of Long Beach, Queen Mary, Aquarium of the Pacific, and California State University at Long Beach (CSULB). The city consists of 50 square miles (excluding water acreage) and had a population of 462,257 as of the 2010 Census. 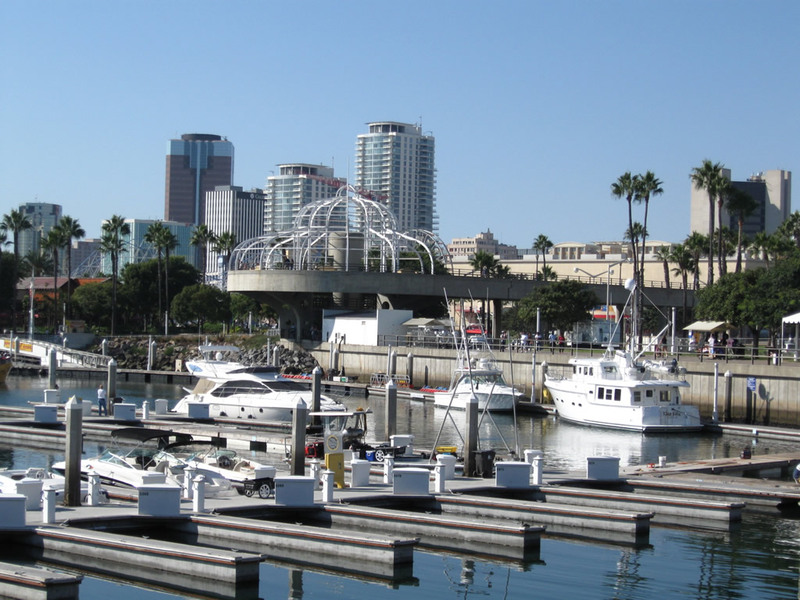 A vibrant waterfront, coupled with multiple tourist attractions, makes Long Beach a popular year-round tourist attraction. Interstate 405 is the San Diego Freeway, traveling east-west through most of Long Beach. A major regional route, Interstate 405 carries traffic from Orange County and points south into Long Beach, then proceeds north to Los Angeles International Airport (LAX) and merges with Interstate 5 near Sylmar. Interstate 710 is the Long Beach Freeway, following the Los Angeles River south into the city of Long Beach. The principal route into the Port of Long Beach, Downtown Long Beach, and the Queen Mary/Cruise Ship Terminal, Interstate 710 divides into several freeway routes upon reaching downtown Long Beach. These freeway spurs are (in sequence as one travels south on Interstate 710): Shoreline Drive, Harbor Scenic Drive, and Ocean Boulevard. Shoreline Drive connects to downtown, the Aquarium of the Pacific, the Pike, and Convention Center; Harbor Scenic Drive continues south as a freeway to the Queen Mary and Cruise Ship Terminal; and Ocean Boulevard carries Interstate 710 west to Terminal Island. The official southern terminus for Interstate 710 is at California 47 on Terminal Island near the border between the Port of Long Beach and the Port of Los Angeles. California 1 is the Pacific Coast Highway. Despite its name, the Pacific Coast Highway stays well inland, away from Downtown Long Beach and mostly north of the main port area. Through Long Beach, California 1 takes a mostly east-west approach. California 19 is a major arterial that travels north-south through eastern Long Beach. Originating at Los Alamitos Traffic Circle with California 1 (Pacific Coast Highway), California 19 follows Lakewood Boulevard. The highway passes under a runway for Long Beach Airport, then proceeds north into Lakewood. California 22 enters Long Beach from the east, following Seventh Street from the Interstate 405-605 interchange complex to its end at California 1 (Pacific Coast Highway). Most of California 22 within Long Beach city limits is not a freeway. The state route upgrades to a freeway east of Interstate 405, as it passes through Garden Grove, Santa Ana and Orange. California 47 and 103 follow the Terminal Island Freeway alignment from Interstate 710 (Ocean Boulevard) north to the end of the freeway at Willow Street. California 47 departs from the freeway at the off-ramp for Anaheim Street andHenry Ford Avenue. A portion of the Terminal Island Freeway is located in Los Angeles, and the remainder is in Long Beach. California 47 also follows Ocean Boulevard west of the Interstate 710 interchange until passing into Los Angeles. California 91 is the Artesia Freeway. Carrying significant traffic across the northern tier of Long Beach, California 91 also connects to Gardena to the west and Anaheim and Riverside to the east. This major freeway sees substantial use especially east of California 55 as it travels up the Santa Ana Canyon. 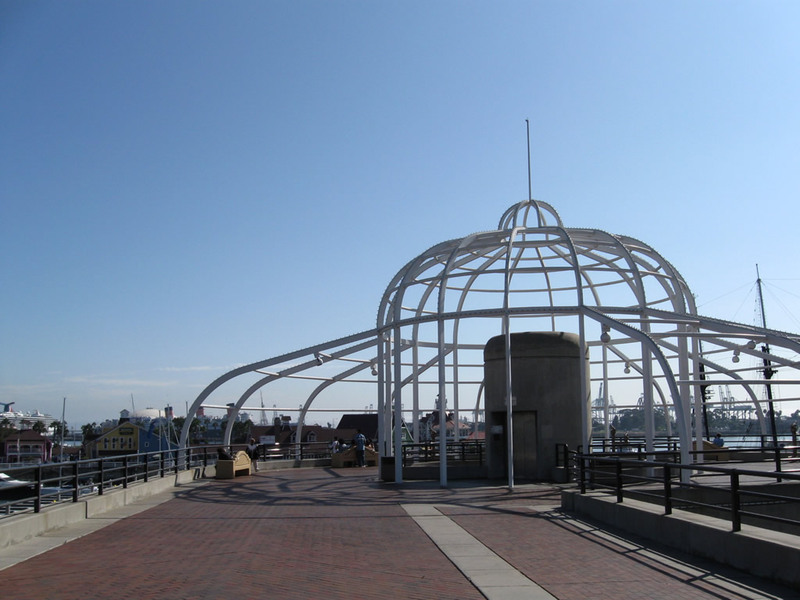 Harbor Scenic Drive connects Interstate 710 with the Queen Mary and Long Beach Cruise Ship terminal, all within the Port of Long Beach. Leaving the Queen Mary and Cruise Ship Terminal within the Port of Long Beach, a freeway entrance shield assembly for Interstate 710 is posted along northbound Harbor Scenic Drive after the signalized intersection with Harbor Plaza, Queens Highway, and Harbor Scenic Drive. Photo taken 05/02/10. Harbor Scenic Drive carries three northbound lanes until it splits with Queens Way north to Downtown Long Beach. Photo taken 05/02/10. Northbound Harbor Scenic Drive meets Queens Way north to Downtown Long Beach. Photos taken 05/02/10. The next exit from Harbor Scenic Drive north connects to Queensway Drive. Photo taken 09/28/08. Tall trees and green medians give Harbor Scenic Drive a parkway like feel. Although some of the signs look like Caltrans standard, the highway is maintained by the Port of Long Beach. Photo taken 05/02/10. The next exit from Harbor Scenic Drive north is with Queensway Drive to Hotel Maya and the Residence Inn. Signs for this exit were replaced between 2008 and 2010. Photo taken 05/02/10. Second photo taken 09/28/08. The off-ramp from Harbor Scenic Drive north to Queensway Drive loops makes a U-turn back toward Pier H. Photo taken 05/02/10. Second photo taken 09/28/08. This mileage sign along Harbor Scenic Drive provides the distance to the next three exits. The Anaheim Street interchange is found on Interstate 710, while the ensuing two exits are from Harbor Scenic Drive north. Photo taken 05/02/10. Approaching the off-ramp for Ocean Boulevard east to Downtown Long Beach along Harbor Scenic Drive north. Photo taken 05/02/10. Photo taken 05/02/10. Harbor Scenic Drive north at Ocean Boulevard. There is no access from here to Interstate 710 south or Ocean Boulevard west to Terminal Island. Photo taken 05/02/10. The connecting ramp from Harbor Scenic Drive north to Ocean Boulevard east ties into a bridge across the Los Angeles River. The downtown Long Beach skyline comes into view. Photo taken 09/28/08. Paralleling the Los Angeles River, Harbor Scenic Drive north passes under Ocean Boulevard. A flyover ramp brings traffic from I-710 north onto the freeway. Photos taken 05/02/10. Harbor Scenic Drive ends at the point where Interstate 710 joins the freeway from the left. Photo taken 05/02/10. Ocean Boulevard is a major arterial that begins as part of the Interstate 710 freeway leaving the Port of Long Beach and extends east across the Los Angeles River and through Downtown Long Beach. Past Alamitos Beach and Junipero Beach, Ocean Boulevard continues east into Belmont Shore to a dead end at Alamitos Park, near the outlet of the San Gabriel River. 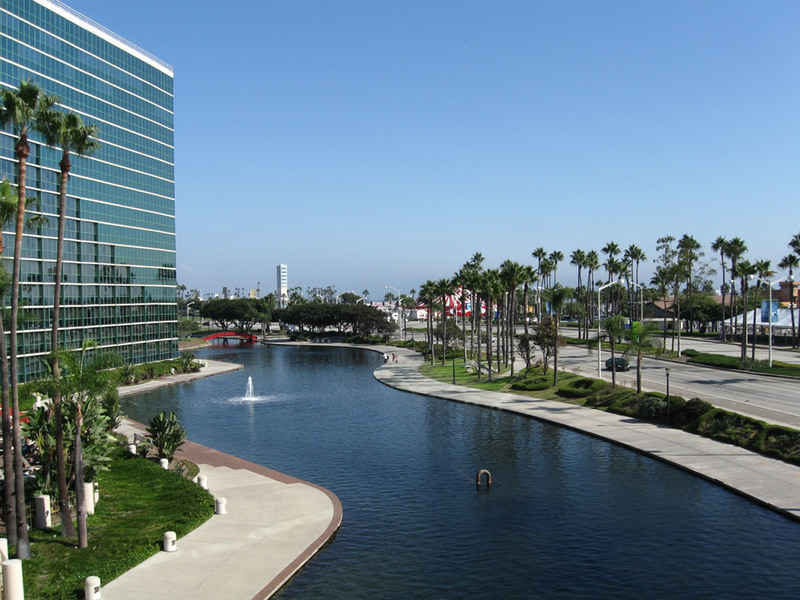 This picturesque and beautiful road defines the coast of Long Beach and connects to many of the Downtown and beach attractions. 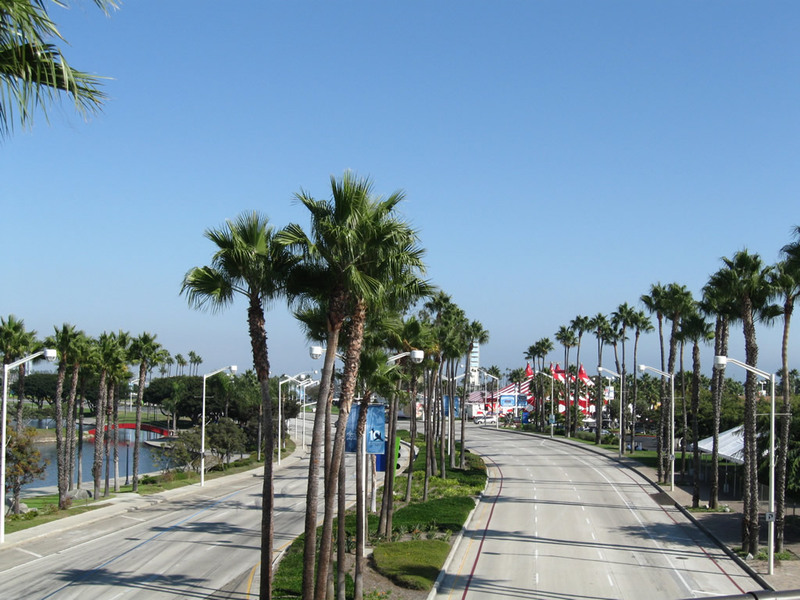 Ocean Boulevard commences eastward as part of the Interstate 710 freeway. Prior to the signed extension of I-710 to Terminal Island and the Port of Long Beach, the segment of I-710 between California 47 and the left exit to Ocean Boulevard (including the Gerald Desmond Bridge) was originally also part of Ocean Boulevard. Many still refer to that segment of Interstate 710 as part of Ocean Boulevard. Photo taken 09/28/08. After Interstate 710 shifts onto the Long Beach Freeway north, Ocean Boulevard continues east as a short freeway that connects the Gerald Desmond Bridge with Downtown Long Beach. The succeeding exit is for Pico Street and Piers A through J. Photo taken 09/28/08. Eastbound Ocean Boulevard at Pico Street and Piers A through J. Ahead, Ocean Boulevard crosses over the Los Angeles River. Photo taken 09/28/08. The transition ramp from the Gerald Desmond Bridge to the Long Beach Freeway flies over Ocean Boulevard beyond the Pico Street off-ramp Photo taken 09/28/08. As the downtown Long Beach skyline comes into view, Ocean Boulevard passes over the Los Angeles River. Photo taken 09/28/08. Interstate 710 trailblazers along Ocean Boulevard east reference the upcoming intersection with Golden Avenue. Golden Avenue leads north to an on-ramp for I-710. Photos taken 09/28/08. Ocean Boulevard east at Golden Avenue north. Continuing east, the arterial advances to Magnolia Avenue and Queens Way south to the Queen Mary. Photo taken 09/28/08. Three blocks east of Golden Avenue, Ocean Boulevard meets Magnolia Avenue north and Queens Way south. Queens Way south heads to the Queensway Bay Bridge, the Queen Mary, the Cruise Ship Terminal, and Pier J. Photo taken 09/28/08. Ocean Boulevard overtakes Livingston Drive west at a wye intersection with Mira Mar Avenue near Belmont Pier. Ocean Boulevard proceeds westalong the beach to Downtown Long Beach. Photo taken 05/02/10. Approaching Redondo Avenue, the Pacific Ocean and Junipero Beach come into view on the south side of Ocean Boulevard. Photo taken 05/02/10. Westbound Ocean Boulevard meets Coronado Avenue at the Bluff Park neighborhood. Photo taken 05/02/10. Ocean Boulevard intersects Paloma Avenue, which leads two and a half blocks north to East Broadway. Photo taken 05/02/10. Temple Avenue leads north from the ensuing westbound signal to the Bluff Heights neighborhood. Photo taken 05/02/10. Beyond the intersection with Lindero Avenue, Ocean Boulevard shifts slightly away from the beach by the Long Beach Museum of Art. Photo taken 05/02/10. Aside from a few exceptions (such as Temple and Cherry Avenues), each intersecting street along westbound Ocean Boulevard descends in alphabetical order. Junipero Avenue intersects Ocean Boulevard west of Kennebec and Lindero Avenues and east of Cherry Avenue, Hermosa and Gaviota Avenues. Photo taken 05/02/10. Cherry Avenue heads north from Ocean Boulevard to the city of Signal Hill and an interchange with Interstate 405 (San Diego Freeway). Photo taken 05/02/10. Westbound Ocean Boulevard meets Gaviota Avenue and South 11th Place. Photo taken 05/02/10. Ocean Boulevard west at 8th Place and Esperanza Avenue south. Many of the streets leading north along this stretch are one-way. Photo taken 05/02/10. The Downtown Long Beach sky lines appears along westbound Ocean Boulevard at Orange Avenue. Orange Avenue is another exception in the general rule of alphabetizing the north-south streets in descending order from east to west. Photo taken 05/02/10. Back to back traffic signals operate along Ocean Boulevard west at Cerrittos Avenue south and 3rd Place. Photo taken 05/02/10. Alamonitos Avenue and Shoreline Drive come together at Ocean Boulevard on the east side of Downtown Long Beach. Photo taken 05/02/10. Alamitos Avenue connects Downtown with Signal Hill and Interstate 405 at Exit 29C. Shoreline Drive arcs southwest toward Rainbow Harbor along the south side of Long Beach Convention and Entertainment Center to eventually form one of the legs for I-710 north. Photos taken 05/02/10. Continuing west from Shoreline Drive, Ocean Boulevard proceeds through the Long Beach central business district toward the Civic Center and Queens Way south to the Cruise Ship Terminal and Queen Mary. Photo taken 05/02/10. Atlantic Avenue runs 1.6 miles north from Ocean Boulevard to meet the historic western terminus of U.S. 6 (Grand Army of the Republic Highway) at California 1 (Pacific Coast Highway). Photo taken 05/02/10. The succeeding signalized intersection along westbound Ocean Boulevard is with Linden Avenue. Photo taken 05/02/10. Ocean Boulevard west at Elm Avenue. Photo taken 05/02/10. 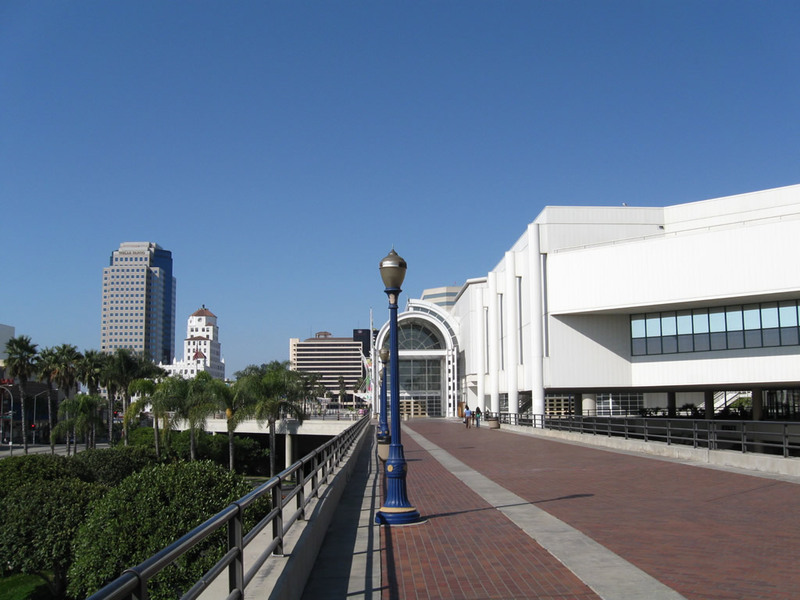 Long Beach Boulevard ties into Ocean Boulevard across from the Temple Theatre and Long Beach Convention Center. A plaque located on the south sidewalk here commemorates the original western terminus of the Grand Army of the Republic Highway (old U.S. 6). Photo taken 05/02/10. Westbound Ocean Boulevard meets The Promenade at this traffic signal in Downtown Long Beach. Photo taken 05/02/10. 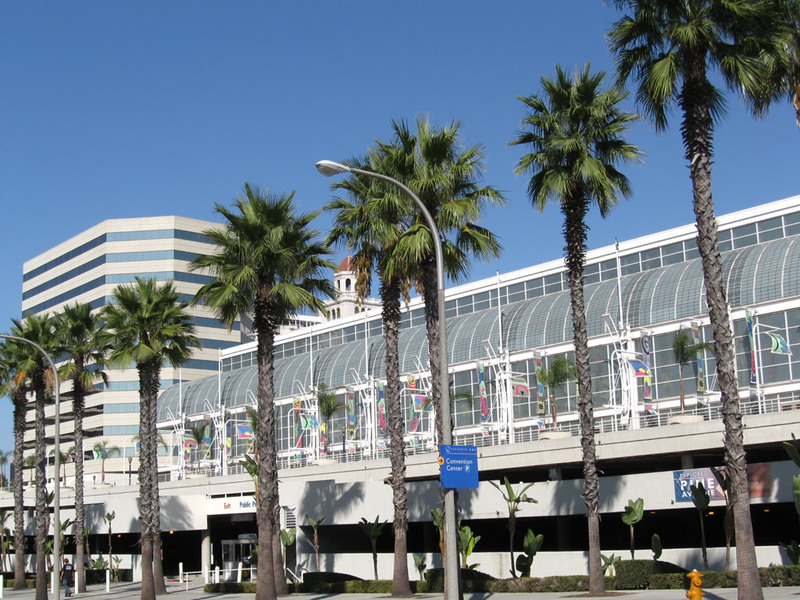 Pine Avenue south connects Ocean Boulevard with the Long Beach Convention and Entertainment Center, Aquarium of the Pacific, Shoreline Village, The Pike, and Water Taxis. Photo taken 05/02/10. Ocean Boulevard west next meets Pacific Avenue north to Interstate 710 via westbound Seventh Street. The Long Beach Civic Center,which includes historic Lincoln Park (established in 1888) and the Long Beach Public Library, lies on northwest corner of this intersection. The civic center building was completed in 1977. Photo taken 05/02/10. Advancing west from Pacific Avenue, Ocean Boulevard passes by the Long Beach Civic Center, the courthouse and the Renaissance Long Beach Hotel. Photos taken 05/02/10. Ocean Boulevard meets Magnolia Avenue north and Queens Way south at the subsequent westbound signal. Queens Way south links with the Queensway Bay Bridge to Harbor Scenic Drive en route to the Port of Long Beach Piers G, H, and J, the Queen Mary, and the Cruise Ship Terminal. Photo taken 05/02/10. Just west of Magnolia Avenue along Ocean Boulevard is the signalized entrance to the World Trade Center. This area has several hotels and banks akin to a financial district. Photo taken 05/02/10. The signal at Maine Avenue operates at a parking garage exit from the south. Maine Avenue is otherwise discontinuous south of Broadway. Photo taken 05/02/10. The final traffic signal along Ocean Boulevard in Downtown Long Beach is with Golden Avenue. A northbound on-ramp connects with Shoreline Drive ahead of the Long Beach Freeway (Interstate 710 north). Photo taken 05/02/10. Ocean Boulevard becomes a freeway after the Golden Avenue intersection. The initial exit from this nascent freeway is with Pico Avenue to Piers A through J. Photo taken 05/02/10. Interchange sequence sign listing the succeeding three exits from Ocean Boulevard west. Photo taken 05/02/10. Passing over the Shoreline Drive freeway and the Los Angeles River, westbound Ocean Boulevard approaches the ramp onto Pico Avenue. Pico Avenue north connects with I-710 via an on-ramp at West 9th Street. Photo taken 05/02/10. Construction of the new Gerald Desmond Bridge included a revamp of the exchange joining Ocean Boulevard with I-710, Harbor Scenic Drive and Pico Street. The westbound off-ramp for Pico Avenue was slightly realigned, while new bridge approaches were built west to the cable-stayed bridge across the Back Channel to Terminal Island. Photo taken 05/02/10. Ocean Boulevard remained elevated above Pico Avenue and nearby port areas while a flyover carried traffic from the Gerald Desmond Bridge east to Interstate 710 north. All bridges here were demolished as part of the new Gerald Desmond Bridge project. Photo taken 05/02/10. Ocean Boulevard west was subsumed by Interstate 710, which proceeds west over the Gerald Desmond Bridge onto Terminal Island. I-710 ends at the interchange with SR 47; SR 47 continues Ocean Boulevard west to the Los Angeles city line at Seaside Avenue. Photo taken 05/02/10. Queens Way connects Ocean Boulevard in Downtown Long Beach with the Pier H attractions, including Queen Mary and the Cruise Ship Terminal. Queens Way travels south from Ocean Boulevard as a freeway. Unique bridge railing line the road as it passes over Seaside Way and Shoreline Drive. Photo taken 05/02/10. The off-ramp from Queens Way southbound to Golden Shore Street and Catalina Landing departs after the bridge over Shoreline Drive. Photo taken 05/02/10. Continuing south across the Queenway Bay Bridge, Queens Way will partition into a left side ramp for the Queen Mary and Cruise Ship Terminal and a right side ramp to the Port of Long Beach and South Waterfront Hotels. Photo taken 05/02/10. Second photo taken 09/28/08. Traffic from Shoreline Drive merges onto southbound Queens Way as the freeway proceeds south over the mouth of the Los Angeles River. The Queensway Bay Bridge opened to traffic in 1969. Photos taken 05/02/10. A banner overhead sign welcomes travelers along Queens Way south to the Port of Long Beach. The left three lanes lead to the port, Queen Mary, and Cruise Ship Terminal. The right lane links to northbound Harbor Scenic Drive, which connects to Interstate 710 (Long Beach Freeway) north. Photo taken 05/02/10. Beyond the Queensway Drive off-ramp, traffic quickly splits with ramps for Harbor Scenic Plaza and Harbor Plaza to the Port of Long Beach Piers F-G-H-J. Photos taken 05/02/10. Queens Way south lowers to run along side Harbor Scenic Drive south to the Queen Mary and Cruise Ship Terminal. Photos taken 09/28/08. All traffic enters the Queen Mary area. Photo taken 09/28/08. Queens Way passes over Harbor Plaza and Queensway Drive with three southbound lanes. Photo taken 09/28/08. This sign precedes the partition for the ramp to the Queen Mary general parking lot, serving area hotel and restaurants. Photo taken 09/28/08. Queens Way concludes with traffic separating for the Queen Mary and the the Cruise Ship Terminal. Photo taken 05/02/10. Originating at the intersection of Ocean Boulevard and Alamitos Avenue east of Downtown Long Beach, Shoreline Drive loops southwest toward Rainbow Harbor, then west to the Los Angeles River. Paralleling the river, Shoreline Drive forms part of the Downtown spur expressway to Interstate 710. Beyond the traffic signal with Aquarium Way, Shoreline Drive passes under an elaborate pedestrian bridge that links The Pike shopping area on the north side of Shoreline Drive with the Aquarium of the Pacific on the south side of the roadway. Photo taken 09/28/08. The next traffic signal along Shoreline Drive west is with ramps to Queens Way. The Queens Way freeway south spans Queensway Bay to Pier H (Cruise Ship Terminal and Queen Mary). Photo taken 09/28/08. A large parking garage is located next to The Pike market on the north side of Shoreline Drive. Photo taken 09/28/08. The Downtown Long Beach skyline rises just west the intersection with Queens Way south and Chestnut Place north. A wye interchange joins Shoreline Drive with Queens Way, which is a freeway all the way to the parking entrance for the Queen Mary and Cruise Ship Terminal. Photo taken 09/28/08. Westbound Shoreline Drive passes under the Queens Way viaduct. Photo taken 09/28/08. West from Queens Way, Shoreline Drive transitions to a freeway. Shoreline Drive is locally maintained by the Port or City of Long Beach, and not a part of Interstate 710. Photo taken 09/28/08. Shoreline Drive passes under Golden Shore and curves to follow the east bank of the Los Angeles River. A loop ramp departs next for Ocean Boulevard. Photo taken 09/28/08. The loop ramp connects directly to Ocean Boulevard west to Interstate 710 south and use Golden Avenue south for Ocean Boulevard east into Downtown Long Beach. Photo taken 09/28/08. 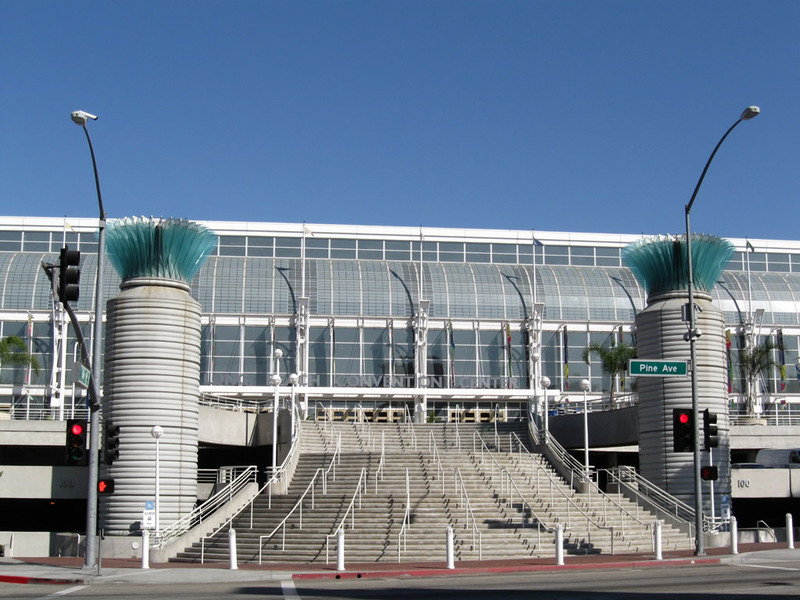 A left side ramp follows for a U-turn back to Shoreline Drive east to Rainbow Harbor, the Aquarium of the Pacific, and the Long Beach Convention Center. Photos taken 09/28/08. Shoreline Drive passes under the ramp from Shoreline Boulevard south to Broadway east. Photo taken 09/28/08. A wide median separates the two directions of Shoreline Drive between Ocean Boulevard and the merge with Interstate 710. A passive park with turf and trees offers visual relief to passing traffic. Named Cesar Chavez Park, it does not seem to have any pedestrian access from the freeway. Photo taken 09/28/08. The freeway turns northwest to cross over the Los Angeles River via the Shoemaker Bridge to connect with Interstate 710 (Long Beach Freeway) north toward Pasadena. Photo taken 09/28/08. The ensuing exit is for Anaheim Street and Ninth Street. This is the final off-ramp from Shoreline Drive north. Photo taken 09/28/08. Northbound Shoreline Drive meets the off-ramp to 9th Street, which extends west to Anaheim Street. Photo taken 09/28/08. Shoreline Drive travels northwest across the Shoemaker Bridge over the Los Angeles River. This view looks along the river north from the bridge. Photo taken 09/28/08. Caltrans maintenance takes over from the city of Long Beach as Shoreline Drive transitions to Interstate 710 (Long Beach Freeway) north. Photo taken 09/28/08. Page Updated November 12, 2010.